Posted on Mon, Jan 9, 2012 : 12:20 p.m. The Michigan basketball team could know soon whether or not it will have the services of Jon Horford again this season. Michigan coach John Beilein said the 6-foot-10 sophomore forward will have an X-ray today on his right foot. "It has not happened yet," Beilein said this morning on the Big Ten coaches teleconference. "It's just an X-ray today, as a matter of fact." Michigan sophomore forward Jon Horford has missed the last seven games with a broken bone in his right foot. Last week, Beilein said the coaching staff would have a better understanding of Horford's status after the exam. Horford, a sophomore from Grand Ledge, has missed seven consecutive games with a broken bone in his right foot. 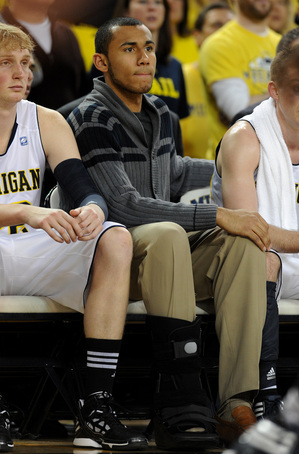 In Michigan's last six games, Horford has been dressed in street clothes with a large walking boot on his foot. He has not been seen walking with crutches, though. Originally, Beilein said he didn't see the injury as being overly serious. But in time, exams revealed stress fracture to the fifth metatarsal of Horford's right foot. "If we feel the rest of his season's in jeopardy, then it doesn't make sense to play him," Beilein said late last month. "Unless there comes a time in February where he says he's 100 percent healthy and he wants to play and we feel we need him to play, which is pretty obvious (we do), then he can continue on with his season." When Beilein was finalizing his 2010 recruiting class, he had a decision to make. Tim Hardaway Jr. or Southfield native Devyn Marble? Obviously, Beilein went with Hardaway. Marble — a Southfield native — ended up at Iowa. It was a situation Beilein called a win for both teams. "One thing I really liked about Devyn was his birthday, he was so young," Beilein said. "We were really in a choice between Devyn Marble or Tim Hardaway. We made a choice with Tim. "Obviously we wouldn't have gone wrong with Devyn. ... I think Iowa and Michigan both won in that situation." After averaging 13.9 points per game as a freshman last season at Michigan, Hardaway is the Big Ten's sixth-leading scorer at 15.9 points per game. During his freshman season at Iowa, the 6-foot-6 Marble averaged 5.7 points per game. This season, Marble is averaging 10.6 points per game. Michigan travels to Iowa on Saturday. Beilein was asked what some of the challenges have been during his rebuilding process at Michigan, and if he could recall one particular point where the program had turned a corner. The fifth-year Michigan coach couldn't point to one game, but did say some of the bad losses the team suffered early were just as important as any signature win. "It's not like (the top teams) are going to back off and say 'OK, let's let Michigan or Iowa get in here now,' " Beilein said. "We had a great win over Duke and UCLA my second year, but you'll have great wins and you have to keep pressing on. Handling success is sometimes tougher than handling the adversity of growing the program. "Some of our biggest moments have also been our biggest losses, and we got better from them as well. You've got to take the good and the bad and try to grow both ways." Beilein was asked again to discuss the current impact freshman point guard Trey Burke is having on his team. The numbers are obvious, as Burke's averaging 13.8 points and 4.5 assists per game. But in the locker room, Beilein says the rest of his roster loves playing alongside the steady freshman. "(Michigan senior captain Zack) Novak has told me several times, 'I love playing with Trey Burke,' " Beilein said. "That helps a great deal, when your No. 1 leader loves his point guard. "He's been accepted very well. But you have to show that on the weight room, on the court, in the classroom, the whole thing, to gain that acceptance. And Trey's done a great job of doing that." Mon, Jan 9, 2012 : 8:34 p.m.
beilein's comment on recruiting hardaway rather than marble is an excellent answer. it lauds marble as a bb player and makes the point that both iowa and michigan signed great kids and great players. john beilein gave an answer that any parent would be glad to hear------plus-----i believe he's sincere. Mon, Jan 9, 2012 : 5:54 p.m.
&quot;One thing I really liked about Devyn was his birthday, he was so young,&quot; Beilein said. That's an odd comment. Marble is six months younger than Hardaway, Jr....so what?